PRL’s Cabo Series Top Hung Slider Doors are becoming ever more popular with our customers. Our Cabo Aluminum Sliding Door can be used with or without a bottom guide channel, making it suitable for interior or exterior applications. The beauty of the door is that is slides almost effortlessly and very quietly. This “value engineered” product is very competitively priced, easy to install and offers great sound control, using 1-1/8″ insulated glass and double sealed interlocking stiles. In addition to these great features, they are available with incredibly fast lead times. 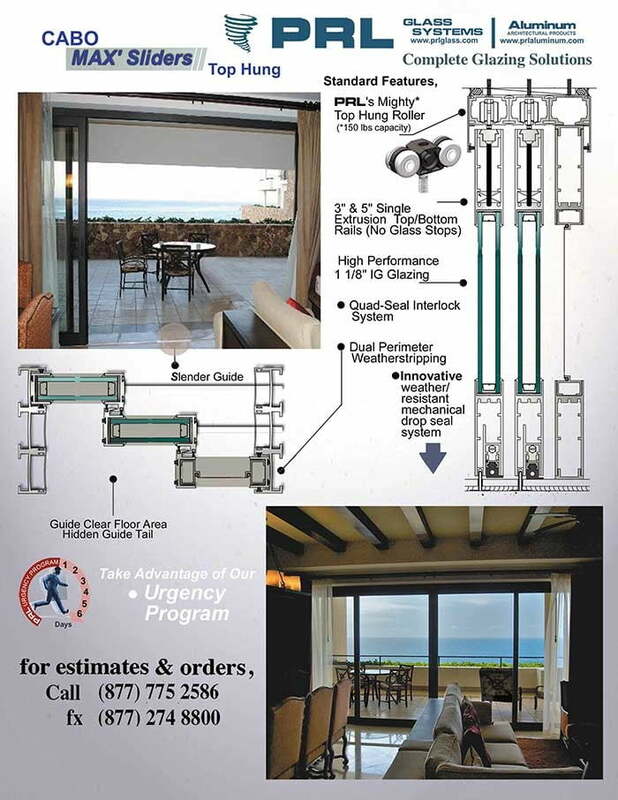 Designing, manufacturing and fabricating glass and metal systems in house allows PRL to offer you quality products, made in the USA, with “Tornado” lead times!! Please contact PRL Aluminum for more information and fast quotes!! !